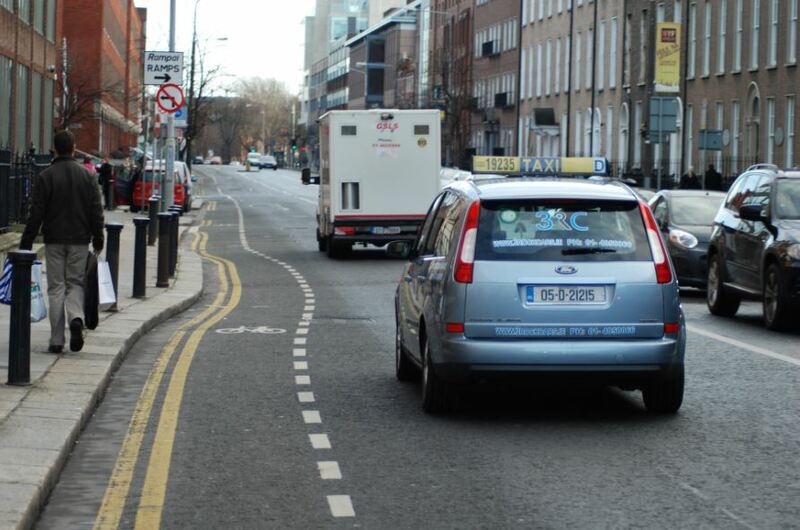 This image was taken last month of Mount Street Lower in Dublin… is it an old issue? It sure it, but the road has since been resurfaced in very recent history without the city council bothering to fix the flaws in the cycle lane. The bend outwards shown between the white van and blue taxi pushes bicycles into or at least closer to the flow of traffic. The dashed nature of the lane lines allows motorists to enter and drive in the cycle lane. When the road was being resurfaced, the cycle lane should — in accordance with the first edition of National Cycle Manual — been made into a solid-line cycle lane and it should have been widened, removing the bend in the lane. The old red surface was also remove — as has been done around the city. Rather than fix the issue of poor red surfacing, they are just scraping the red surface. Send suggestions to hello@irishcycle.com. And make sure to view the original and UK-focused facility of the month page on Warrington Cycle Campaign’s website. I am editor of IrishCycle.com and have reported on and commented on cycling in Ireland for over a decade. My background is in journalism -- I have a BA in Journalism from DCU and HDip in Print Journalism from BCFE. I wrote about cycling for national newspapers, and then started CyclingInDublin.com for overflow stories. Later the website was re-branded to reflect a more national focus. I am on this run regularly and it is an unsafe anomaly. It arises because the flight of steps into the building adjacent to it obtrudes into footway so there is a partial footway build-out to compensate for safer pedestrian movement. The GVL is wide enough for a fair-line to have been taken by the entire cycle lane. Contouring line-painting is not acceptable in this situation. I keep asking the question: Was a road safety audit performed on this upgrade by an independent consultant? PLEASE click here to support independent journalism by helping with the costs of running IrishCycle.com. Contribution of any amount are welcome and will fund on-going costs such as hosting, domain names, promotion, travel, FOI/AIE appeals and equipment — for example, readers like you have funded a much needed new laptop. Thank you!